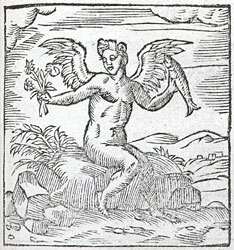 Alciato at Glasgow: Emblem: Potentia Amoris. Puissance d'Amour. Nudus Amor viden’ ut ridet, placidumque tuetur? Scilicet ut terrae iura det atque mari. Do you see how Love, all naked, smiles, do you see his gentle glance? He has no torches, nor a bow to bend, but in one of his hands he holds flowers, in the other a fish, to impose his rule, of course, on land and sea. Il n’y a si douce chose. En terre qu’en la marine. & par le poisson, qui represente la mer. 1. These were traditional attributes of Cupid (Love). See [FALc109] and [FALc113]. 2. Variant reading in 1550, Scilicet et terrae iura dat ..., ‘to be sure he imposes his rule both on land ...’.